Not sure what is happening, but I can't seem to log on anymore. I knew my password, but I tried to reset my password to see if that would help and it did not send me a reset email. When I click Sign In orange button now it does nothing, does not show that I have the wrong password or anything. I have checked your emails in our system and I have found 2 Free accounts created with the same email address jenni.huber@gmail.com as the following: "purpleelephantphotography" and "jenni.huber". There is not any account related to your email address jenni@purpleelephantphotography.ca. Most probably, you have confused your accounts' email addresses and passwords. Could you please check your SPAM/JUNK/BULK folders of your email address? 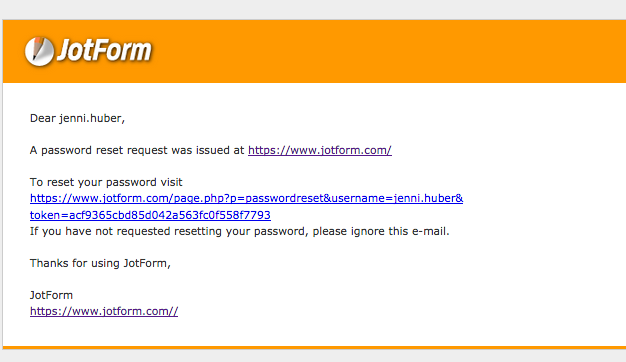 If you see JotForm emails there, please mark them as NOT SPAM and move them to the inbox. Furthermore, I have sent a password reset email for your account named "purpleelephantphotography" also. Please try to log in again and tell us if you need any further assistance.